¿Qué tienes en tu casa? Este sitio web usa Cookies que miden y analizan nuestro tráfico. Para más información sobre las cookies que usamos, lee los términos de uso. Si quieres cambiar tu decisión después, haz clic en la opción "Política de Cookies", ubicada en el pie de página. 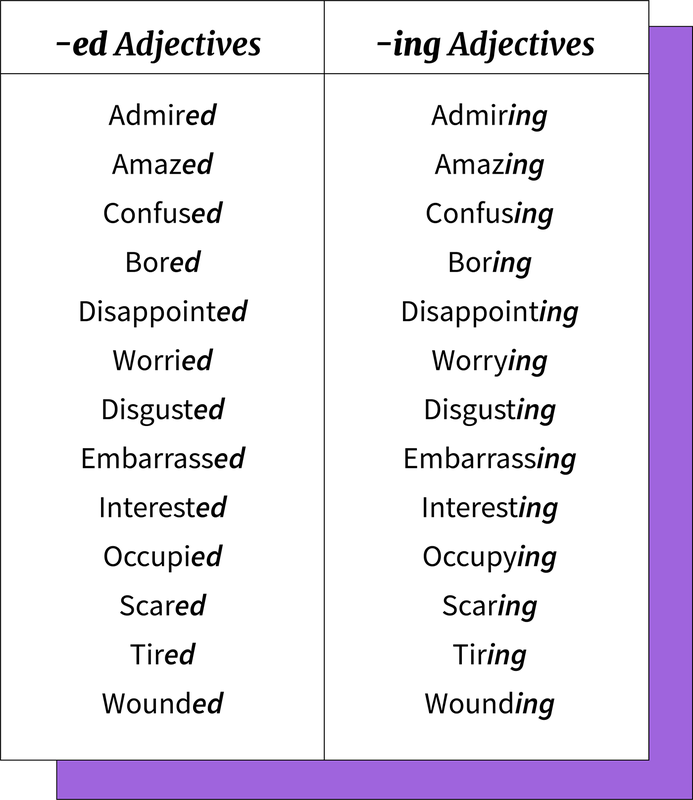 These suffixes are not just used to form the past and continuous verbal tenses. They are also used with adjectives. This type of adjectives is composed of a verb and the suffix -ed or -ing. Always remember that the sense of the sentence changes according to the suffix used. This is used to indicate or describe emotions. In other words, it indicates that the subject or person is feeling something. In the sentence, it follows the verb to be. Its Spanish relative is "-ado", "-ido". These adjectives indicate or describe the qualities of something or someone and are also used to refer to objects or situations. Just like with "-ed" adjectives, it follows the verb to be in the sentence. To talk about a person, use -ing adjectives to indicate a permanent quality, and use -ed adjectives to indicate a temporary quality.